Police block the streets near Mandalay Bay hotel, where Stephen Paddock opened fire on thousands of people attending a concert. The shooting prompted security agencies to review their protocols for outdoor events. Katie Fuhrmeister initially mistook the gunshots for fireworks. 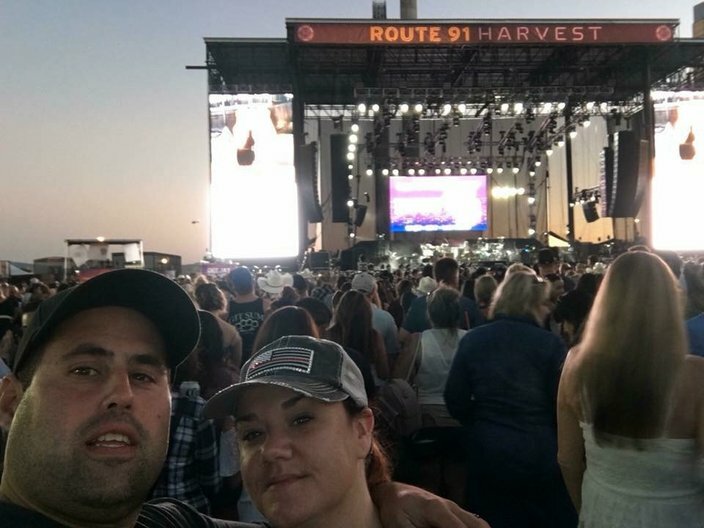 So did many others among the 22,000 fans who had gathered along the Las Vegas Strip last October 1 to enjoy the final night of the Route 91 Harvest music festival. But Fuhrmeister was mystified that she couldn't see them. It wasn't until the third or fourth round of pops that Fuhrmeister – and many others, including country music star Jason Aldean – realized what was happening. Someone, somewhere, had opened fire on the crowd. Fuhrmeister, of Horsham, Montgomery County, looked at her husband, Robert, and they immediately took off running. Thousands of other people did the same. "I didn't even look around to see," said Fuhrmeister, a 38-year-old mother of two children who were safe at home. "We just ran." "For us, it was, we've got to get out of here," she added. "We've got to get back to our kids. We've got to live for our families." The Fuhrmeisters survived the nation's deadliest mass shooting in U.S. history without serious physical injury. They were fortunate. 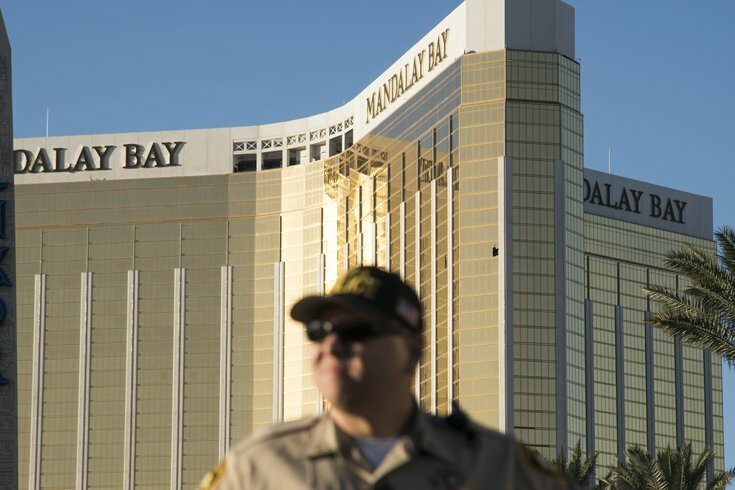 But 58 people were killed – and hundreds and hundreds more injured – that Sunday night as Stephen Paddock rained 1,100 rounds onto the crowd from the 32nd floor of the nearby Mandalay Bay hotel. Katie, who suffered a sprained ankle, does not recall seeing anyone who was shot. But she saw thousands of people doing anything in their power to find safety. Many of them scaled fences, including one surrounding a gated church nearby. "Their legs were getting stabbed with these spikes that were on the fence," Fuhrmeister recalled. "My husband decided, 'I'm going to kick down this gate' that was there. He was able to kick that out. We were able to run through the parking lot. Everybody tried to help everybody run." Eventually, they made it back to their hotel room at the Westin, and returned home to their suburban Philadelphia home the next day. Nearly eight months later, Katie Fuhrmeister has reached a point where discussing the event can be more helpful than hurtful. The experience has changed the way she acts when she goes out in public. She always wants to know where the nearest exit is located – particularly when she enters unfamiliar buildings or venues. "That's the first thing I do wherever I go now," Fuhrmeister said. "If it's a mall that I don't know, I have to know exactly where I'm going. ... At concerts, I'm always like, 'Where's my best exit?'" The Las Vegas tragedy is just one on a lengthy list of mass shootings to play out across America in recent years. A high school in south Florida. A Baptist church in south-central Texas. A nightclub in Orlando. An elementary school in rural Connecticut. The world has witnessed shootings at concerts, churches, office buildings and schools. Explosions have occurred outside concert venues, and vehicles used to kill pedestrians on busy streets. There's a lot that police and security agencies can – and should – do to protect crowds from harm. And there are important debates to be had regarding gun control. But security experts say there also are steps that individuals can take to increase their chances of survival, should an event like this occur. One of the best actions is to follow Katie Fuhrmeister's example – know where the exits are located and have a plan of escape. Mark Lomax, a former executive director of the National Tactical Officers Association, encouraged people to observe the exterior of any venues as they wait to enter. Once inside, he said they should determine two or three different exit options. "Be mindful of where the exits are," said Lomax, now chief executive of Lancer Cobbs, a consulting firm in Warrington, Bucks County. "If something did happen, where would you go toward? Most people don't even think about that. They just go in there. Their concentration is on the event. They're not looking (at) where can I get out of here if I have to leave." Lomax also recommended people carry identification, as well as a card listing any allergies, blood type and contact information. But he stressed people place that in a pants pocket or their shoe, because people tend to drop their bags during an emergency. "If something bad does happen to you, and you're not able to tell the first responders who you are, it provides identification, it provides your address," Lomax said. "It also helps law enforcement in eliminating suspects. If you have 30 people laid out somewhere and they can identify people, that's a good thing." If a threat takes place, Lomax stressed the need to briefly assess the situation before responding. There may be lots of screaming. General chaos. And misinformation may be circulating. "A lot of times you may want to take a breath, try to relax a little bit," Lomax said. "Try to take cover if there's cover near you and try to assess what other options there are to leave this venue, unless police are there. ... then, you follow police instructions." It's also not always the safest decision to follow the crowd, Lomax said. Sometimes, perpetrators plan an initial attack that is designed to draw people toward a more deadly secondary threat. "I always say the first person to listen to is yourself," Lomax said. "Most of the time you have to listen to what your gut is saying – 'Go right, go left, go up, go down.' In 99 percent of major events, like (the Las Vegas massacre), there's going to be false information coming out within seconds or minutes of the event – because nobody knows." Do not try to pack up your belongings before leaving. Grab any small children and try to extricate yourself from the surroundings as quickly as possible. The faster you can leave, the higher your chance of survival. "The reason these attacks have the success level they have is that all that timing is in control of the perpetrator – and not in the control of the venue," said Joseph Alkus, a Temple University professor who previously served as a special agent for the U.S. Department of Homeland Security. A crowd watches a concert during the 2015 Made in America festival on the Benjamin Franklin Parkway in Center City. Terrorist groups have moved away from attacking hard targets – critical infrastructure with existing security apparatus, like power plants, bridges and transit systems – to soft targets like sporting events, concerts and festivals, Alkus said. Coupled with a rise in lone-wolf perpetrators, law enforcement and security agencies are confronting challenges they did not envision a decade ago. Firearms remain a deadly option, but security must also watch for weaponized drones, improvised explosive devices and vehicles being used as weapons. "We do a pretty good job on sophisticated attacks, because there's certain things we can do, like monitoring the intelligence," Alkus said. "The problem that we're faced with now is the lone wolf – the lone attacker who may be self-radicalized – who may not show any precursory activities, like talking about things on social media or making threats. "The attack can be very unsophisticated – like driving a truck through a barrier." Or, in the case of Las Vegas, a shooter positioned stories above the crowd. That scenario highlighted another area of concern for security agencies. 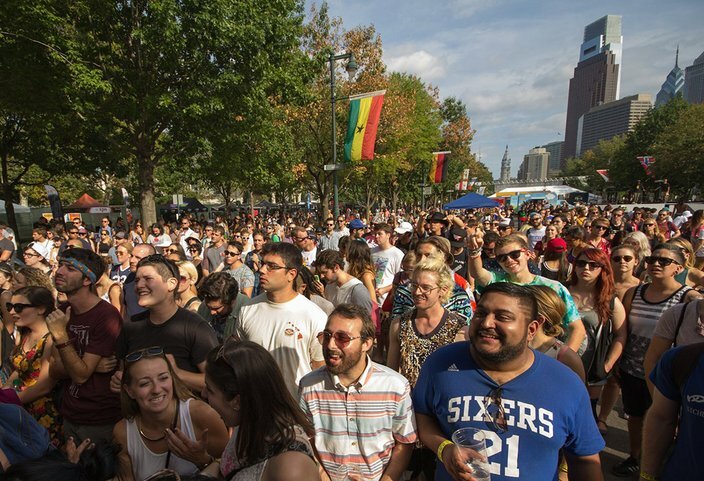 In Philadelphia, summer concerts like Wawa Welcome America and the Made in America Festival draw tens of thousands of people to the Benjamin Franklin Parkway, a thoroughfare overlooked by several high-rise buildings. Prior to massive events, detectives inspect those buildings. An aviation unit is deployed to keep an eye on rooftops. And there are counter-surveillance officers stationed within the crowd. "We're looking at everything – every tip, every threat," Deputy Police Commissioner Dennis Wilson told reporters last fall, in the wake of the Vegas shooting. "We have teams of investigators that are looking at this. They don't wait until the morning. If it comes in the middle of the night, they're going to conduct a very fast investigation." Most organizations now take a risk-based approach to their security planning, said Robert Dodge, executive vice president of G4S, the world's largest security risk management firm. That entails identifying the threats most likely to occur, and developing a security strategy aimed at detecting such threats. Security at most events is grouped into three zones, Dodge said. That includes the outer perimeter, which is supported by the transportation network, including parking areas. Then there is the middle zone where people undergo screening via magnetometers, canine units and covert surveillance detection. The third zone encompasses the venue itself, with various systems in place. "We understand that the top threat is terrorism," Dodge said. "They're going to come at us with a bomb in their bag, for instance. We want to make sure we have screening for that on multiple levels, so that if one fails, the other catches up." The idea is to create as much time and distance between people and any potential threat, Dodge said. That will give first responders more time to neutralize the threat, and put as much distance as possible between the threat and the crowd. Following the Las Vegas shooting, the hotel industry changed many of their protocols, Dodge said, though he declined to elaborate. But he said security event planners, government officials and private sector have worked to eliminate the specific threat posed by high-rises. "The reality is, in an open society, unless you lock down everything there's not a ton you can do," Dodge said. "But what you can do is try to maximize the competency of your security, your planning. Make sure you're integrated with law enforcement, so you know what their response looks like." And for the people venturing out to public events, Dodge reiterated advice offered by other security experts. "Situational awareness is very, very important," Dodge said. "That's really your best option. The second thing I would say is trust your instincts. If something doesn't feel right, don't go down that staircase or get in that elevator." 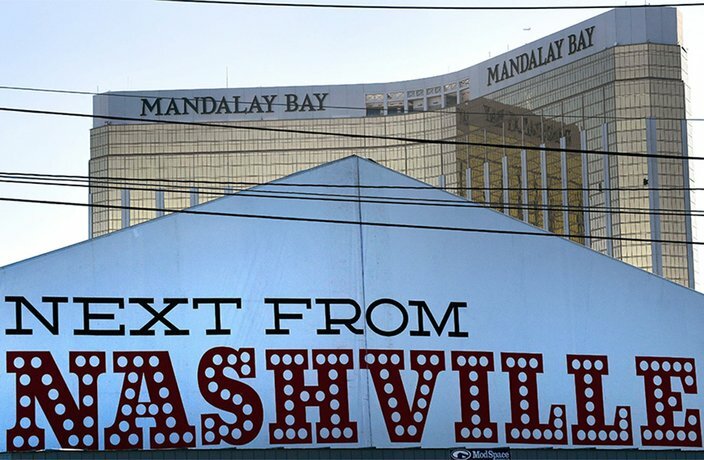 On Oct. 2, 2017, the day after the Las Vegas massacre, two broken-out windows (right) in the shooter's room on the 32nd floor of the Mandalay Bay Hotel and Casino can be seen from Las Vegas Village, the site of the annual Route 91 Harvest country music festival. Following the tragedy, the hotel industry changed many of its security protocols. Instinct took over for Katie and Robert Fuhrmeister when Paddock began firing from the Mandalay Bay hotel. Fortunately, they made it. Others, who may have acted on their own instincts, did not. Having had time to reflect on the shooting, Fuhrmeister said she would encourage others to trust their instincts and take shelter if they can find it. And if you feel you can fight the perpetrator, fight him. "All I could think about was staying alive, not getting shot and getting home to my kids," Katie Fuhrmeister said. "Adrenaline was the biggest factor." But she also urged people to show more kindness toward one another. "I feel that has a lot to do with what's going on," Fuhrmeister said. "Just be kind. It's the oldest saying: Do unto others as you would have them do unto you."